Andrew is the patron saint of Scotland, Ukraine, Russia, Romania, Patras in Greece, Amalfi in Italy, Luqa in Malta, and Esgueira in Portugal. He was also the patron saint of Prussia. The flag of Scotland (and consequently the Union Flag which also features on the flags of Australia, New Zealand and the arms and flag of Nova Scotia) feature St. Andrew's saltire cross. The saltire is also the flag of Tenerife, the flag of Galicia and the naval jack of Russia. The Confederate flag also features a saltire commonly referred to as a St. Andrew's cross, although its designer, William Porcher Miles, said he changed it from an upright cross to a saltire so that it would not be a religious symbol but merely a heraldic device. The Florida and Alabama flags also show that device. But the Saint never actually set foot on Scottish soil. So how did the brother of Saint Peter come to be Scotland’s patron saint? St. Andrew was a Galilean fisherman and the first disciple of Jesus. According to Tradition, Andrew left the Holy Land after Pentecost to spread the Word in lands around the Black Sea, in what are now Romania, Bulgaria and Greece. In 60AD, during the reign of Nero, he was working in Patras, where he baptized the wife and brother of the Governor, Aegeus. The Governor was so incensed by this; he ordered the death of the Apostle. Andrew was crucified on a cross in the shape of an X on November 30 which has since become known as the St. Andrew's Cross and forms the basis of the Scottish flag, the Saltire. Despite having never visited the nation, legend has it that an Angel appeared before Greek monks in Rome and ordered St. Andrew’s remains to be taken from Constantinople (now part of Turkey) to the ends of the Earth for safety. St. Rule (Regulus in Latin) undertook the task but became shipwrecked on the east coast of Scotland at a small town later to become St. Andrews. What probably happened was that the relics were brought from Rome by St. Augustine in 597AD as part of his great mission to bring the Word to the Anglo-Saxons. In 732 they were brought from Hexham to Fife by Bishop Acca, who was seeking asylum with the Pictish King Oengus (Angus). The relics were held at Kirrymont, which was later renamed St. Andrews. From this time, the remains of the first-called Apostle became a major focus of European pilgrimage, second only to Compostella. Numbers coming to venerate the relics of the Saint grew quickly. In the 11th century St. Margaret, Queen of Scotland, endowed a ferry service across the river Forth and hostels, at north and south Queensferry, for pilgrims. The relics were initially housed in St. Rules Church and eventually in the great medieval Cathedral of St. Andrews. Twice a year the relics were carried in procession around the town. Masters and scholars from the colleges, Greyfriars, Blackfriars and Augustinian canons of the metropolitan church and trade guilds all participated. Cathedral and church bells rang and in the evening there were bonfires and fireworks. Through the dark ages, and medieval period of Scottish history, the Apostle played a major role in the creation and defining of the Scottish Nation. 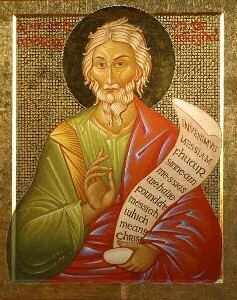 It was commonly believed that the Apostle Andrew had chosen the Scottish people to care for and honor his relics. And so the patron Saint, the saltire flag, the relics and the See of St. Andrew became crucial symbols of nationhood. On 14th June 1559 the interior of St. Andrews Cathedral, including the shrine and relics, was destroyed by reformers who had accompanied John Knox to the city. The three centuries that followed were difficult for Catholicism in Scotland. Catholic worship was outlawed. The traditions were kept alive in a few outlying glens and islands. Catholics in cities and towns had to rely on visiting priests, trained overseas. Priests like the Jesuit martyr St. John Ogilvie operated underground and were put to death if discovered. The image of St. Andrew has come to symbolize Scotland, with his cross forming the national flag (the Saltire), and St. Andrew’s Day on November 30 becoming a celebration of Scotland at home and abroad.